We have a wide range of high speed Rope Braiding Machine- Series BM 600 with special features for our valued clients. Keeping in mind ever-evolving requirements of our respected clients, we are offering a premium quality range of Rope Braiding Machine. 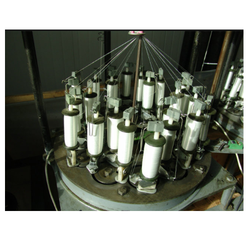 Spindle diamond rope braiding machine. Rope Braiders are nothing but extra heavy duty version of braiders in which you can get tension upto 5 kgs per spindle. We are making in this range up to 610 mm dia. Horn gear, bobbin size 210 mm dia. x 600 mm. length and from 3 spindles braiders to 48 spindles braiders. All the machines in this range are supplied with spring loaded spindles.